Welcome to Demented Design Studios! We specialize in all types of props, products and production. We are here to serve the commercial, haunt and film industry as well as personal and local haunts. We have been in the industry for several years now. What started as a hobby has now become our passion and now we want to share our talents with you. Some of our previous work has been featured on television, in theme parks as well as decorating Mardi Gras floats in New Orleans. So as you can see no job is too big or too small. We custom design haunted house props and halloween decorations. 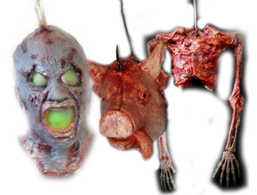 From Bloody Body Parts to Halloween FX Props, we offer Affordable Gore Props and Decorations. Please feel free to browse our site. We do customized work so bring us your thoughts and ideas and let us make them become a reality. If you don't see what you are looking for or want something a little different, please contact us.